Although, Ghana has been successful in reducing childhood diseases especially under five mortality cases through effective control of infectious diseases, childhood cancers continue to affect many children who get little or no treatment at all. As the disease is seeing upward trend experts, advocates and well-wishers are calling for education on the condition to be intensified. The 15th February every year the Accra Labone Leo club the youth wing of Lion club international, a humanitarian club based in Chicago USA had set aside this day to create awareness and educated the Ghanaian public about childhood cancers. Set against this backdrop the club this year took its advocacy onto the doorstep of parents in Ghana to help sensitise them on early reporting of childhood cancer. Speaking with the adviser of the Accra Labone Leo club, Leo Albert Appiah has called on the parents to as a matter of urgency pay critical attention and report to the nearest health facility for examination before it is too late. The past President of the Accra Lions club explained, when diagnosed early enough and treated with the appropriate protocols, over 75 percent of childhood cancers could be cured. According to him as part of the advocacy this year, the club with support from it sister organisations donated boxes of gloves, digital weighing scales, some cartons of bottled drinking water, assorted drinks and biscuits to the Princess Marie Louis Children’s hospital in Accra to help aid them. He added their national agenda for the first quarter of 2019 is to make sure no child is left behind. 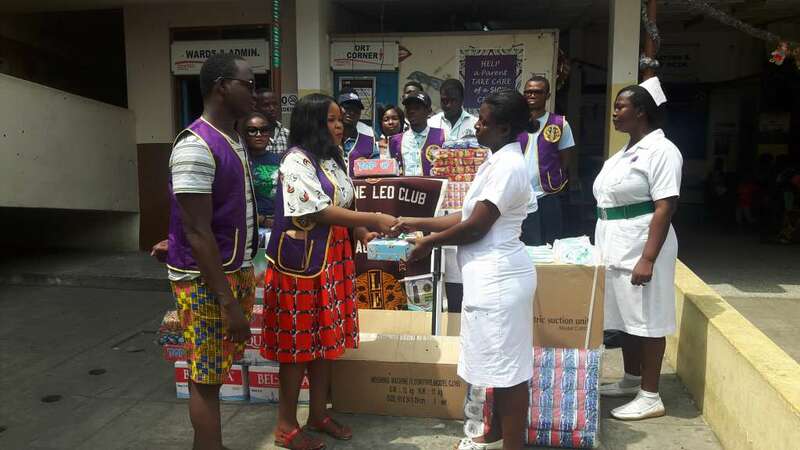 Receiving the items on behalf of the hospital, the Principal Nursing Officer PNO Doris Antwi says the items will go a long way to help the hospital since there’s always a need somewhere to be met. She added even though the hospital receive consumables and other logistics from the Ghana medical store under the Ghana Health Service and the Ministry of health annually, due to the pressure on them due to the number of cases seen on daily basis, there is the need to replace them. Madam Antwi explained that with the recent trend of childhood cancers that demand critical attention it is prudent the requisite tools are used for proper treatment. On her part the president of the Accra Labone clubs Leo Rita Esenam Garglo called on parents and care givers to be proactive with the health of children so as to protect the future of the next generation. Ms Garglo making the club’s presentation says as part of their campaign the club selected four hospitals namely, Korle-bu Teaching Hopital, 37 Military Hospital, La General Hospital and Mamobi General Hospital to help intensify education on how best to cater for cancer patients. Adding the other wing of the club in the rest of the region in the country is replicating same gesture to cover every child. Meanwhile, according to the World Health Organization estimates, globally, more than 11 million people are diagnosed with cancer every year. Cancer causes 7 million deaths every year – or 12.5% of the 58 million deaths worldwide – this being more than the combined total deaths from HIV/AIDS, TB and malaria. By 2020, it is estimated that there will be 15 million cases of cancer annually, 70% of which will occur in developing countries. The GLOBOCAN also estimates that 16,600 cases of cancer occur annually in Ghana, yielding an age-standardized rate of 109.5 cases per 100,000 persons. The most frequent cancers in men are cancers of the liver, prostate, Non-Hodgkin’s Lymphoma (NHL). The most frequent cancers in women are cancers of the cervix, breast and liver. It is also estimated that 12,700 cancer deaths occurred in 2008.There is also low awareness of cancer in Ghana and as a result most of the cases present in our facilities at the late stage.